A switch to still life today. 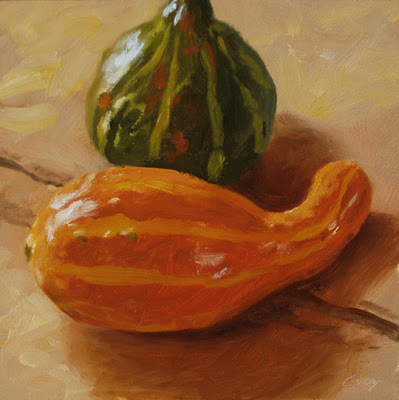 I love the colors of these little gourds. These gourds are stunning. A very fine painting. Hi Silvina, thanks a lot--good to hear from you. "Gourdgeous"--I love it! Thanks, Katherine. I sure appreciate it, Martha. OMG--this is really beautiful--the light shining on the side of the gourds is transcendent! WOW- this one is just luminous! I love the rich colors in this one. Thanks a lot, Deborah. I've been enjoying your blog paintings and commentary.